Plant: shrub; usually less than 1 m tall, the stems with appressed 4-armed hairs, the arms aligned longitudinally Leaves: trifoliolate (except juvenile leaves simple), the leaflets 3-5 times as long as wide, hispid, 1.5-3 cm long Flowers: solitary, short- or long-pedicellate; bracts of involucel linear, ciliate; calyx 17-20 mm long; petals 2-3(-4) cm long, yellow with or without purplish basal spot Fruit: FRUITS ovoid capsules, hispid, 9-10 mm long. SEEDS 2.5-3 mm long, densely sericeous, the hairs 4-5 mm long Misc: Dry, open hillsides and canyons; 300-1200 m (1000-4000 ft); flowering throughout the year REFERENCES: Fryxell, Paul A. 1994. 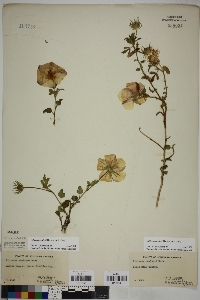 Malvaceae. J. Ariz. - Nev. Acad. Sci. Volume 27(2), 222-236.